The Delphi language, better known as Object Pascal, is a modern strong type-checked and object-oriented language, featuring single inheritance and an object reference model. In recent years, the language has been augmented with record methods, operators overloading for records, class data, nested types, sealed classes, final methods and many other relevant features. Delphi 2009 has more exciting additions including extensions to the string type to support Unicode, generic data types, anonymous methods, and a number of other very interesting features. 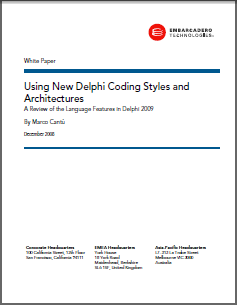 Learn more about the new language features in Delphi 2009 and CodeGear RAD Studio 2009 in this white paper. This white paper has been written for Embarcadero Technologies by Marco Cantù, author of the best-selling series Mastering Delphi. The content has been extracted from his latest book “Delphi 2009 Handbook”, http://www.marcocantu.com/dh2009. You can read about Marco on his blog (http://blog.marcocantu.com) and reach him at his email address marco.cantu@gmail.com. re: Integer/Cardinal data size stays 32 bit??? minor typo on page 21 & 22, procedure TFormMinorLang.btnDepracatedClick( Sender: TObject); Should be btnDeprecated for consistency, I think. Integer/Cardinal data size stays 32 bit?? ?